Styled Three Ways: The T-Shirt.. Links + Likes: Canada Day / Ju.. In celebration of Canada’s 150th birthday, I thought I’d share an updated tour of my space, one which is proudly home to a mix of Made in Canada pieces, thrift store finds and old faithfuls from big-box shops. In tandem, HGTV Canada popped by and filmed a tour of my home (with Piper cameos, of course). In it, I also chat about my love for chips and candy, my design MO and share some intimate insight into my space, so please let me know what you think! This is the first space you see when you enter our home. It’s also the one we spend 90% of our time in. That meant balancing pretty showpieces with comfort and functionality. Previously, a huge IKEA entertainment unit took up the entire TV wall and it was just so massive, so I nixed it (and am selling it, for anyone interested!) and sourced my goodies from Wayfair’s Made in Canada shop—which, you guessed it, only features pieces made or manufactured in Canada. Everything arrived fast, so it was an easy, feel-good choice. It’s not a big space by any means, but we wanted to maximize seating for guests. So along with the yellow sofa (on sale for $899 right now), we have a great side chair, a pouf and big cushions that can double as floor pillows. Ah, the kitchen! My pride and joy. No, it’s not perfect, but I designed and built it with my own two hands for $7,000, so I’m very proud of it. When I designed the space, I knew I needed white. Not because I wanted white necessarily, but because any bold choices would become tired over time as it’s in view the moment you step in the door. 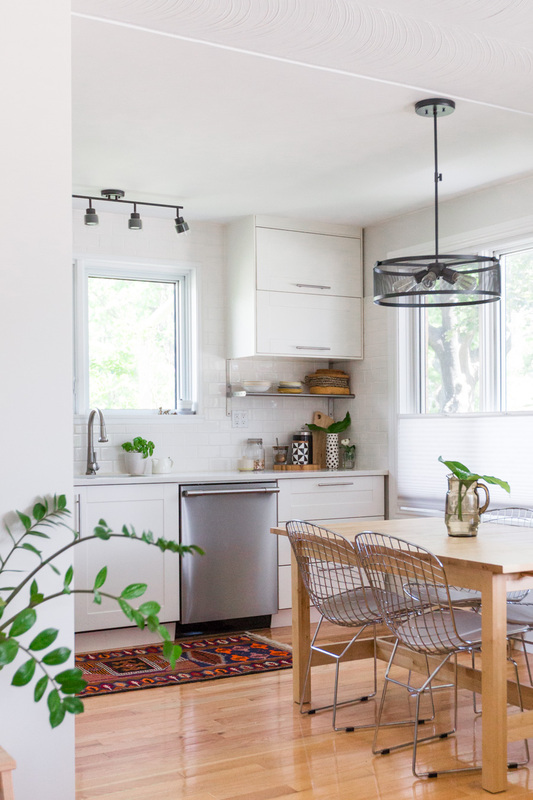 One day I dream to have a kitchen slightly tucked away where a fun hue or tone can be pulled off with more ease, but as my non-forever-house—and because the kitchen can be seen from the front door—white was right. White also allows me to change it up. In previous kitchen posts, I had red or yellow pops, but right now, it’s all wood, black/white and green [all sources below]. In previous iterations of my office, I floated my desk in the middle of the room. But for whatever reason, I was far less inclined to work in there. So, as I do every few months with most of the room in our home, I moved things around. Having the desk under the window is still not ideal, but I find myself working in there more and making use of the space, so it surely functions better. Plus, watching Piper run around the backyard is an added perk that combats the not-as-lovely 6pm sun. The three solid teak bookcases were all auction buys. I fill them with supplies, old magazines I had illustrations in, inspirational books and styling props. My gallery wall is ever-changing, but it hosts some of my favorite pieces (from left to right): a print of street artist Nuria Mora’s work for an IKEA Art Event, Paul Blow, Rasa Morrison, and at the bottom, my favorite: a signed James Jean print. The faux taxidermy is from Leon’s. My bedroom has generally gone unchanged for years save for layout and some new fun accessories, the newest additions being some great textiles from Lorena Canals (a cool company who makes washable products. Great for kids, but adults too!). With neutral sheets, I can get away with changing the accent colour, which right now is green thanks to the monster rug and pillow (linked below). Mixed with natural materials and brass and you can’t go wrong! The most recent room in my home to under a transformation, my dressing room is small but mighty. The rich, solid wood dresser, chest and nightstand set the tone, and the deep green walls (in Benjamin Moore’s Lafayette Green) added to the mood. Then I added a few soft-furniture items, accessories, lots of mirrors and greenery. Hope you enjoyed the tour! Let me know if you have any Qs and join the conversation on Instagram.